When Taylor Swift moved to Nashville at the age of 14 to pursue a career in country music, we're pretty sure no one could have predicted that she'd skyrocket to the top of the charts. 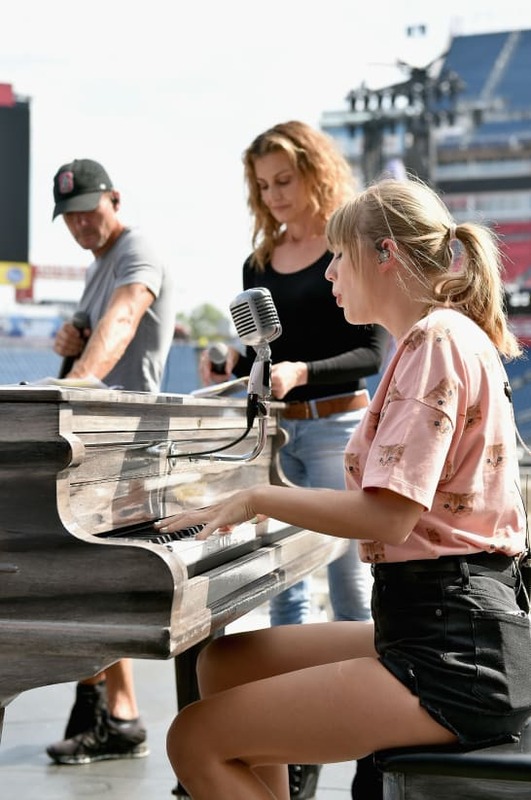 Now, she's 28 and performing with major heavy-hitters in the Tennessee town, which is home to the Country Music Hall of Fame and a place where dozens of country artists — including Nashville royalty Tim McGraw and Faith Hill, who performed with Swift onstage over the weekend — got their start. As reported by People, Nashville fans got a pretty major surprise at the latest stop on the singer's "Reputation Stadium Tour." Swift performed the first part of her first-ever single, aptly titled "Tim McGraw," with a piano solo. She then announced, "Make some noise for Faith Hill, Nashville." When Hill walked onstage, she and Swift hugged before performing the second verse and the chorus of the song together. 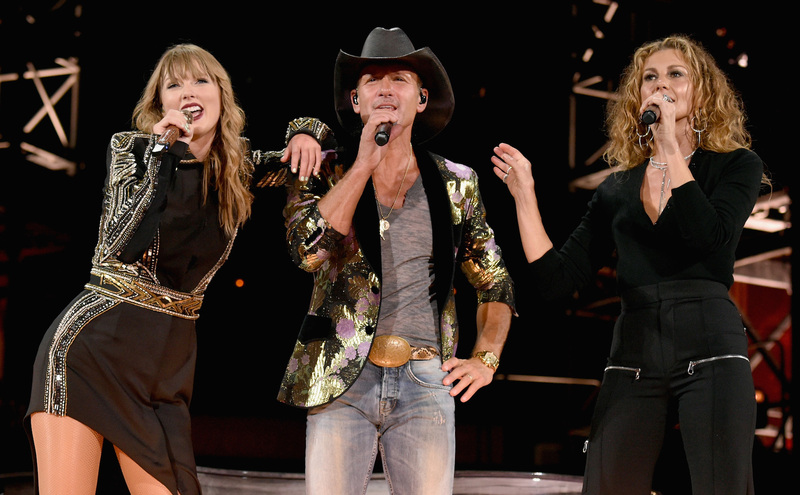 Then McGraw himself joined Swift and Hill, his wife of 21 years, to perform the bridge and finish the song. "Tim McGraw" was released in 2006 on Swift's self-titled debut album. It's pretty incredible that she got to perform the track with its namesake and his wife, two of the biggest heavy-hitters in country music. Swift's Nashville tour stops are always special, not just because she started her career there. During her 2015 "1989 World Tour," she spent two nights in the city, performing with some major names in music. According to Billboard, Swift shared the stage on those nights with Aerosmith's Steven Tyler, the Rolling Stones' Mick Jagger, bluegrass legend Alison Krauss, British pop superstar Leona Lewis and rising country star Kelsea Ballerini. In April, Swift put on a surprise intimate show at Nashville's Bluebird Cafe, truly returning to her roots in the city. As reported by USA Today, singer Craig Wiseman headlined the small show, which had just about 40 people in the audience; Swift's appearance was totally unannounced. "I wanted to say a big thank you to the Bluebird Cafe," Swift told the small audience. "I think any songwriter in town would echo my sentiments and say that this is kind of the only place where this exists — this particular place where you get to come and hear the writer's take on the songs they've put out into the world." Although Swift is arguably one of the most famous performers in music today, as evidenced by her star-studded guest lists on tours, it's evident that she really loves what she's doing. The nostalgia imbued in her performance with McGraw and Hill calls back a very different time in her career while also celebrating how far she's come.